Potatoes thrive in deep, loose soil making them ideal for growing in a large bucket or container - but the tops do require some additional support. One easy way to that is to plant them in a deep bucket and add more soil as the potato plants grow. Drill three to four drainage holes in the bottom of the bucket. This allows excess water to drain through the bottom of the pot and prevents the soil from remaining water-logged. Fill the bottom of the bucket with 4 to 6 inches of soil. A mixture of garden or potting soil, peat moss and compost - in equal amounts - works well. Adding either perlite or vermiculite is an option, but not necessary. Cut the section of the potato so that each section has at least two eyes. Potato eyes look like tiny dimples where a new bud forms. Place one or two sections into the soil and cover with 2 inches of soil. Water thoroughly until water runs freely through the bottom of the bucket. If you have a saucer under the bucket, empty the saucer after watering. Place the container in a location that receives 6 to 8 hours of direct sunlight a day. Potatoes will grow with less light, but size and production will be inhibited. Add new soil when the potato plants reach a height of 4 to 6 inches, leaving the top 2 inches of foliage above the soil. 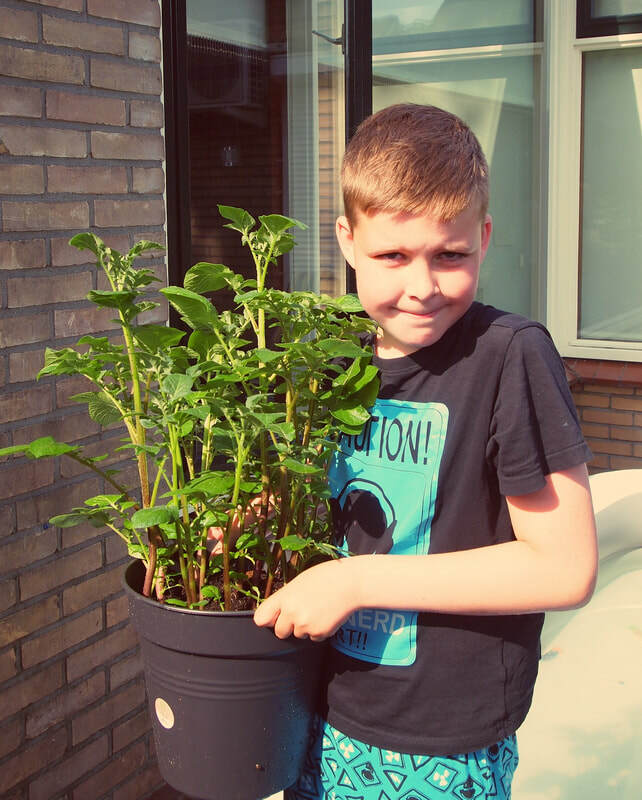 Repeat the procedure as the potato plants grows until soil reaches to within 2 inches of the top of the bucket. This gives the tubers room to grow. Allow the plant to grow freely from this point on. Water deeply once or twice a week, allowing the soil to dry slightly between watering - but do not allow the soil to remain dry for long periods. For the best potatoes, develop a routine of regular watering. Keep in mind that soil dries quickly in containers - especially during hot, dry spells. You plants may require daily watering. Apply water-soluble fertilizer designed for vegetables when your potato plants are 4 to 6 inches high and again in 4 weeks. An additional dosage when the potato plants bloom boosts production and increases yield. Harvest "new" potatoes two weeks after the plants bloom. For mature potatoes, allow the plants to die back naturally in the fall before harvesting. When harvesting new potatoes, gently dig under the plants and remove the tiny potatoes. Replace the soil and allow the plant to continue growing.